I have always been fascinated by windows, although I wonder why? If I’m carrying my art paraphernalia, more often than not, I’ll seize the opportunity of sketching them. And thankfully, there are plenty of alluring windows across the world to keep me busy, from contemporary sleek designs that are minimalist and functional to traditional, ornate and decorative ones with superfuous embellishments. For example the woven bamboo windows in Japan, Gothic windows, stained glass windows, casements, tilt and turn windows in the West, classical chinese windows, louvered windows in tropical countries or Arab world’s projecting oriel windows enclosed and carved with exotic wood latticework. Some are functional while others are pieces of fine craftsmanship. 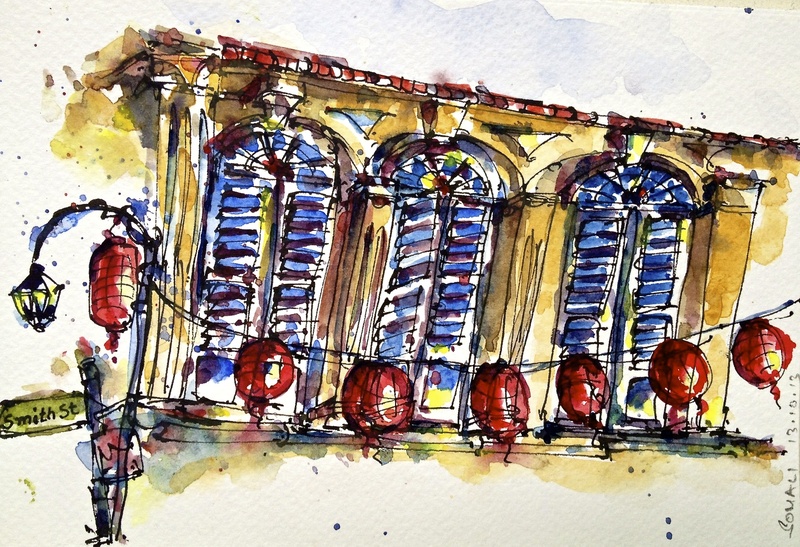 But then, could it just be the physical attributes – shape, colour, form, design that render windows as interesting subjects and make them sketchworthy? I reckon, my fascination is beyond the superficial. There must be something deeper. Besides their make which is anything but monotonous, windows assume a character often borrowed from the environment they are in and evoke an immediate sense of place. 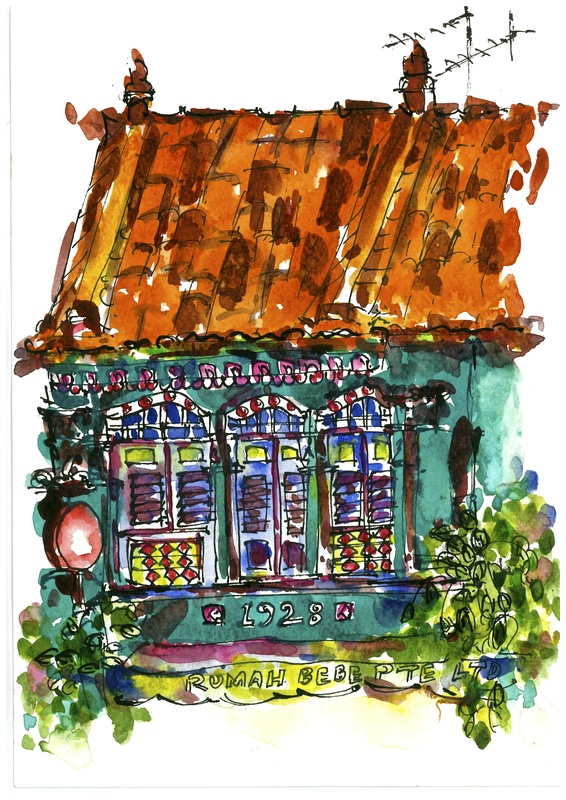 Like these louvered windows of Straits Chinese shophouses in Singapore’s Chinatown (in the picture above) which by themselves are interesting no doubt but when laced with a string of red lanterns around their neck, during the ongoing mid-autumn festival, they look bright eyed, coiffed and spruced up. They seem to be rejoicing, perhaps singing a happy song! In addition to the ethos they live in, windows also assume a character that is refracted by the souls that live behind them, open and close them or peer through them, which could be anything from cheerful to doleful, nifty to sloppy, careful to negligent and is left to the imagination of the onlooker like me to interpret in a hundred ways. 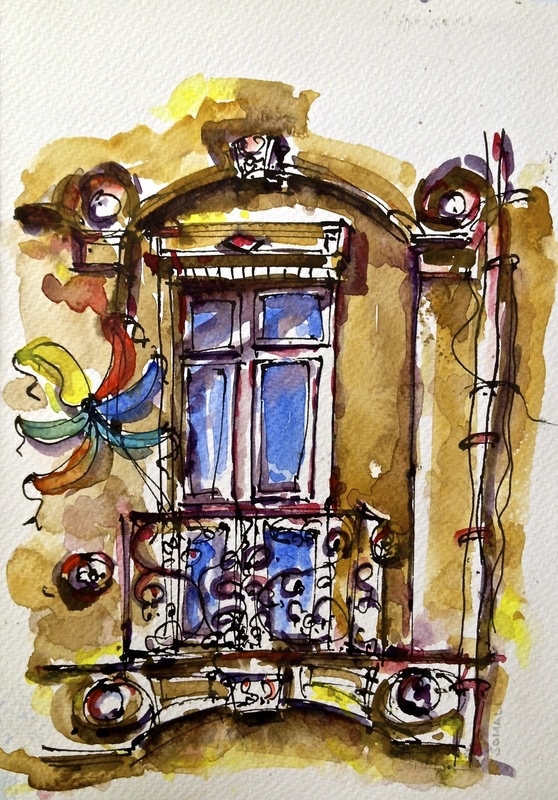 Like this window in Bordeaux, south of France (in the sketch above), that caught my eye not just because of the ornate Gothic architecture encasing it and the filigreed balcony though both make it an attractive subject but because of the colourful pinwheel spinner that separates it from others in the same building. The pinwheel lends it the character of being cheerful, lighthearted, playful, romantic perhaps; and it hints at a story that is open for speculation. Did a little girl tie it there when she was playing in the balcony? or was it relegated as a window decoration by the old man whose grandchildren forgot to pack it in when they left? Maybe the newly weds who just moved in, bought it at the village fair and put it there? I would never know but I adore the touch of mystery that tickles the mind. I’ve seen windows with clothesline slapped across their chests with pinafores, socks, drawers and vests fluttering in the sun, while many have potted plants and flowers set outside them, or a handcrafted easter egg, a gnome, pair of toads, an wooden owl or a fiery crystal dragon resting on their sil – all lending character, telling stories, making them fascinating to absolute strangers. Some windows have gnarled black cables criscrossing their face while some share a patch of rampant vegetation growing from the corner of a drainpipe running alongside. Sometimes on a chilly winter evening the sight of a half drawn lace curtain inside a glazed casement window, hinting at warm bodies moving unsteadily lets you believe in possibilities as many as your mind can conjure. Perhaps that is why I am fascinated by windows because not only are they attractive in their own right, they don’t impose on your imagination as rigid unflinching objects, rather feed off it as volatile subjects arousing a multitude of sentiments in each one of us who looks at them with a different eye and that is enough for a creative person to pick up a pen and sketch them pronto. 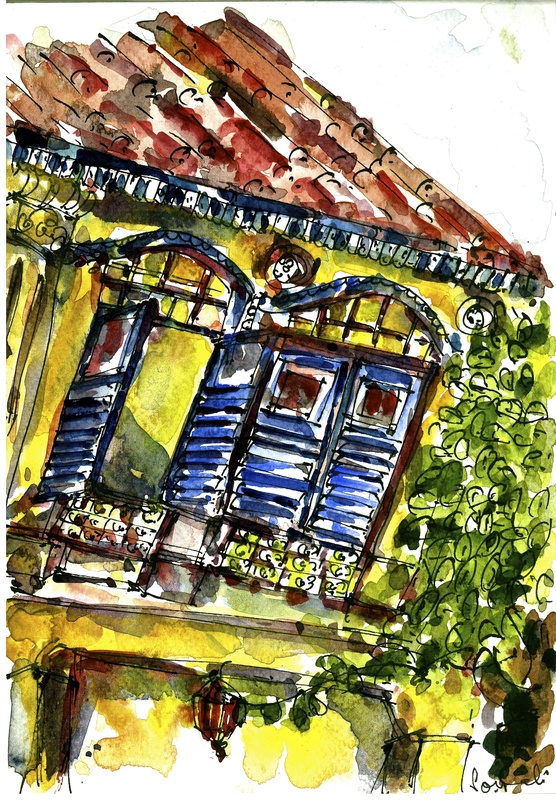 This entry was posted in Daily Vignettes and tagged bamboo, Bordeaux, Casement window, chinatown, classical, gothic, Gothic windows, lanterns, louvered, louvered windows, oriel, painting, Singapore, sketch, Stained glass, Window on October 1, 2013 by Somali Roy.